"ok, do you like me." itachi blushes in embaresment. Suri pokes her fingers together blushing."Yeah.... "She said in a low voice. "Hehe.."She says still poking her fingers together. itachi gives Suri a hug trying not to fall of the tree. Suri hugs him back still blushing. she puts on an awkward smile. "Well anyway its my turn.Truth or dare?" "Hmm...i dare you to....run around and say suri is the best. "Suri says with an evil smile. 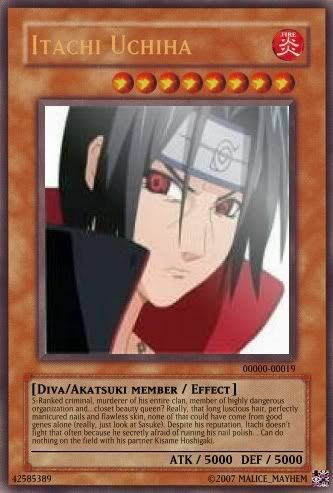 itachi jumps off the tree and starts to run around the tree saying Suri is the best. itachi then jumps up and lands sitting next to Suri. "Would you eat that branch?"